residence order - ruling on who a child will live with. contact order - ruling on who has a right to see a child, often detailing how often and when. specific issue order - ruling on a specific issue raised with the court (e.g. can a child by circumcised). How Do I Apply For a Court Order? You will need to fill in the correct court form. 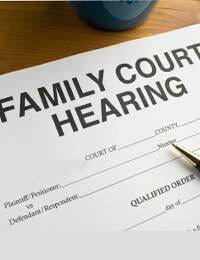 This varies depending upon the type of order you want, but all forms can be downloaded from Justice.gov.uk For most family law disputes, this form is called C100, however there is a list of forms on the website, or all family forms can be found here. Most forms have guidance leaflets or checklists to assist you in filling them in. Use these carefully, as if your form is not filled in correctly, it may not be processed. Once you have completed your form, you need to send it back to your local county or family court. There is usually a cost to file your form. You can check the exact cost with your local county or family court. A debt claim usually costs about £70, but a family order application could be as much as £200. My common law partner and I split in February last year. Since then he has left me with all the debts/Bills he didn't pay when we were together. He put my name on all the household bills as well as his without my permission. He was the sole earner and responsible for all the bills etc. I now have the bailiffs onto me and as I am on benefits I cannot possibly afford to pay off the debts. Can I take him to a small claims court at all? You may be able to ask the court to decide issues relating to division of assets / debts. They can also determine who is responsible for bill payments etc. However be aware that the courts do not have the same ability to award assets from one party as they can upon divorce, if you are not married. The court can only divide the assets / debts of an unmarried couple by determining who they actually belong to. If the debts are occurred in joint names, you will both be responsible for the whole sum of the debts. This means that the utility companies can unfortunately pursue you for the whole amount. You may be best in the short-term to try to agree a payment plan with the utility companies. I need to get a court order lifted but don't know how without losing all my wages with a solicitor. Is there any way we can get into court without going through a solicitor? You do not need a solicitor or legal representation to make or obtain an order. However, particularly for family law orders, this is often advised, as the forms and procedure can be quite complicated. The judge also has discretion to order something that you have not applied for, so you need to consider family law orders as a whole, rather than just the order you are applying for. A court order may affect your / your child's life in a way you had not thought about, so it always worth discussing the plans to apply for an order with a solicitor first. You may be able to get free legal advice from your high street solicitor, or the Citizen's Advice Bureau, so if you are worried about the cost of getting legal advice, investigate this option! You can contact your local branch of the Citizen's Advice Bureau Citizen's Advice Bureau or call 08444 111 444 for assistance. How Do I Enforce An Order? There are various methods of enforcing orders, and which method is best depends upon the original order and the status of the parties in relation to each other. a) have a warrant of execution (which can essentially end up with bailiffs collecting money / possessions to sell to satisfy the order). b) You could however also ask for an attachment to earnings if the debtor has no valuable goods but works. By this method, part of their wage would be paid to you monthly. However bear in mind that this is not likely to be a high amount, and so it may take months / years to be repaid, and payments will stop if the debtor becomes unemployed. c) Banks often ask for a charging order against a Property. This does not result in any immediate money, but will mean that once the debtor eventual sells their Property (if for example they move house), the money will be collected, along with interest, in a lump sum. You do not have to enforce a judgement in the same court that the original order was made, but if you wish to use a different court, you will need to apply to the original court for the case to be transferred. Transfer requests are often approved on the basis, for example, that parties have relocated to a different part of the country. I have a financial court order in place to sell my house. My ex and I are separated now for over 2 years. I took her to court in October to try and get the house sold. Agreed on 75% (her) and 25% split. She is still not happy about this and is dragging her heels saying she hasn't found anywhere to live. I know on top of this she can borrow up to £150,000 on her 16 hour a week salary. But, I know that she isn't even looking. I have my children every other weekend and live in a flat. Have just had another child and really need to move for the space. She says tough. What can I do I feel that I have not progressed anything by taking her to court she is now going to say all the time that she hasn't found anywhere to live. I pay the mortgage on the property until sale. At wits end. Should I just take her back to court and if I do can she be ordered to pay the costs? In order to enforce an order, be aware that you will incur further costs, though these can usually be claimed back from the debtor. In general each step of enforcement costs about £100. In deciding which step to take to enforce an order, it is often important to find out how much the debtor can afford to pay, or in the case of forcing sale of a Property, what the person can afford to pay in rent etc. The easiest way to find out this information is to ask the court to order the debtor to attend court and provide evidence of their income or spending (e.g. produce bills and bank statements). It costs approximately £50 to order someone to attend court. If you wish to send a bailiff to collect your money, or deduct money from someone's wage, you will need to fill in the relevant form from Justice.gov.uk The court can also freeze money in someone's account if needed to stop money being spent before you are paid your share as per an earlier order. I am a single mum with two children. My ex-boyfriend got a court order to see the kids and he lets them down all the time. What shall I do? How do I stop my daughter getting hurt by him coming in and out of her life? 1) Agree the change with your ex-partner and make the change on a voluntary basis (this is usually more suitable when you wish to change the specifics of an order such as what days you have contact, rather than whether you have contact or not). For orders made in the family court, if the changes are not contested by your ex-partner, the judge will make a new order at the first hearing. If the changes are contested, you will need to prove that there has been a change of circumstances. (Note that an amendment to the law is not in itself a change of circumstances.) The full process of CAFCASS reports and investigations and representations in front of a judge (like when the original order was made) will start again. To apply to change an order, you will again need to fill in the relevant form which can be found at Justice.gov.uk There is again a cost for filling this form. Be aware that the courts are very reluctant to stop parents seeing their children. Even in cases of domestic violence, the courts will still often allow the offending parent to see their children; they will just ensure that this is supervised at a family contact centre. You may therefore be better suggesting that the specifics of the order are varied (e.g. less contact time until proves can keep regular appointments) rather than suggesting that all contact is stopped. My husband and i are getting a divorce. We live in a council house we have no children and no savings. I work part time and now my husband is out of work. How much will it cost for a property order to be for me to remove his name off the tenancy agreement. Hello, My father died last Saturday 6 April. My sister has obtained a court order to stop me from attending a religious funeral ceremony at my Dad's house. Will I get a copy of the court order from the Court? Can I appeal or take any action? Thank you. My wife, unfortunately, signed a compromise agreement whilst at a remedy hearing after winning her ET case against her former employer in 2011 and after to payments he breached the agreement finally in May 2018 a court order was made for full payment however a variation application was made and in October 2018 it was granted and a set monthly payment plan was put in place. The most recent instalment was paid along with another instalment however a few days later his solicitor sent a letter stating a banking error was to blame and to either return the instalment or keep the instalment and miss next months instalment. My question is..regardless of the excuses made on behalf of the debtor can we enforce a breach of the court order for a missed payment under the above circumstances? I do not want to stop contact / access with dad but want to stop him from using children as a pawn by stopping them from seeing me until he feels I can see them again when he doesn't like something I've done with my life, I have applied for residency on the basis that it stops emotional abuse towards myself and stops temptation of him to use it as a way to control me. The court ordered the ex wife to sell the family house which we both own but she has resided in for last 3 yearsforthwith by 30 August she since has changed the locks on the property and is not cooperating with the estate agents by not allowing them to enter the property to market it or not responding to calls she is completely breaking the law and breaching the court order. How do I rectify this issue call the police or the court and if the court what forms do I need to ask for ? Unfortunately, you would have to refer the matter back to court to have the order enforced. Hi,My ex-husband broke the final financial Court Order two weeks after it was made by adding his name to the deeds of my property after the fact, via the back door and on a technicality in 2008. I took him to Court twice as it took a Penal Notice to get him to comply. I finally got rid of him in 2015.For 8 yrs and 3 months I had to pay for a house I couldn't live in (buy to let) mortgage, let (as he was joint owner and would have had half of rental income) and couldn't sell either! I have made a court application to take this back to court as I have a Court Order which proves that he acted against the Spirit of the Order and in so doing changed the outcome.I have a child (his son) with profound special needs and he has indirect contact only leaving me with all of the day-to-day care so I cannot work as I am a full time carer. I have received an obnoxious email via his legal representative attaching a Form H advising me that my application is vexatious and they will ask the court to make me pay £1,500.00 court expenses. The Original court order was broken 2 weeks after issue and my original Solicitor said she acted on the information available at the time and in good faith.I contacted the Building Society, the Land Registry, financial Ombudsman and two Solicitors and no-one would take responsibility or accountability.I took it back myself in the end as Litigant in Person. If it was broken, surely there is no 'clean beak' settlement? I took my ex to court for debts he ran up whilst living in my home when we split, the court ordered he pay me back and gave him 2 years to pay the total amount. 3 weeks before the court order date was up he fled the country leaving his house to be repossessed and approx £180,000 in other debts. He is now living in Spain if there anyway I can still try and get him to meet the agreements of the court order even though he is now not in the UK ? A court will not issue a letter, a court will only issue a judgement. You can ask a solicitor to write a letter requesting access and your belongings. Or, you can ask the police to accompany you to the house while you remove items that are yours. @Mads - what a tragic situation. There is nothing you can do pre-emptively - you would have to wait until to see if such a situation arises before you take any action (which your solicitors would advise). Hopefully, it wont come to that. My mother died in 2016. Her and her partner of 30 yrs (they weren't married) ran a quest house which they also lived in. Her partner has continued to run the business and has since married his new partner. The house has remained in his and my mothers names. My mother died without leaving a will and I have obtained grant of representation. We now wish to sell the property and it is currently on the market however my mothers partner has recently discovered that he has terminal cancer and it appears that he may die before the house is sold. I would expect that he has made provision in his will for his new wife and that she will inherit his half share of the house while my sister and I will inherit the other half share. We do have a good relationship with them both but need to consider the possibility that if he does die his new wife may decide that she wants to remain in the property although she would be unable to run it as a business. It has been suggested to me that we may have to obtain a court order in case this happens but I am unsure what that means or if it is even the right course of action. We also have to consider that there is a very small amount remaining of a mortgage and if who would be responsible for that if she remains in the house. I hope that this can be resolved amicably but feel I should be prepared should this not be the case! Hope someone out there can shed some light! I have become a victim of Fraud with a Phone company. Investigations confirmed the Fraud happened . In order to implicate suspect , need to get some contact reports which phone network had with the Suspect and vice versa,from the phone company . When requested from the phone company , they toldto submit a COURT ORDER to give the report . Please help me how to get A court order in this regard ? @MarkyW - it's something that is an issue for lots of us. The thing is, a court can allow the parent looking after the kids to stay in the house until they finish school. I don't want to be the bearer of bad news, but she might be able to stay in the house until your your son is 18. Then you should get the house back. I'd have taken it to court when she moved her man in. The court may have prevented this from happening. I'd still seek legal advice, as it's not fair they should both live in your house rent free. The court might be sympathetic to your plight. I sympathise - Rob. I have been divorced from my ex hubby for 2 years now and he has re married. He has left me with £19000.00 worth of debt which I struggle to pay on my wages. I now rent a property and have asked him to sell our property as we both have our names on the house. He refuses to sell and I need the money of the equity to pay some or all of my debt off. what can I do ? You would have to seek legal advice about taking the matter to court. Where one person agrees and another doesn't, only a court can make a decision about what should happen. Therefore, you may wish to seek legal advice. My ex stopped me seeing my son. I rang and txted numerous times. Then had contact with her sisters say she wanted me to go through them and she had started mediation. 3 weeks went by I had seen my son 2 nights over the weekend and still not heard anymore about mediation. Again out of the blue for no reason stopped me seeing my son. And zero contact with her sisters. I went and started mediation. Week later heard off her sister and had my son again. When I was contacted by the mediation I started I was informed my ex doesn't want mediation and won't be going that way. A week later the police were at my door saying I was harassing my ex, when all iwanted was answers when I'd see me son next For the past year where I was told I'd have contact through her sisters I see my boy every weekend. But every week I have no contact until or on the day I'm supposed to have him. She still stops me seeing him out of the blue and get nothing off her sister. Basically I'm in a loop and can't plan things. What would be best for me to do next as the Ex always makes things as awkward as possible for me. She has 2 previous children by her ex before me and stopped him seeing them completely because he didn't like the way she was doing things. Basically what she's now doing with me. If your ex has refused mediation, your only option would be to apply to court, please see link here . As in all cases, the court’s main concern is the welfare of the child in question. The court will always put the child’s best interests first and this main issue will determine the outcome of any application for an order. I am 17years old and will be travelling to south africa in 4 weeks with my youth group.I have limited contact with my mum, she is an alcoholic and is not involved in decisions about my life.She is named on my birth certificate, though she left the family home 5 years ago.To get into south africa, i need to have a completed affadavit from both parents.I do not want to have to contact her, nor do i think she would be so be enough to do this for me, its unlikely she has the necessary photographic id required either.Is there any other way around this? My father passed away 18 months ago so I am now trying to get his Apple ID transferred to my mother as she is his legal representative. Apple has advised that a grant of probate is not adequate and that a transfer can only happen if they receive a court order. Do they have the legal right to insist this? If so where would one start and how much would it cost? My boyfriend and I have recently bought his estranged wife out of their property (transfer of equity - ToE). As part of the transfer, we originally agreed - at her request - that she stay in the property following completion for 56 days. However, the mortgage provider refused this condition and it was removed from the Independent Legal Advice letter prior to completion and stated that she would vacate the property on completion.She is still trying to stay for the 56 days. We have said that we are not averse to this, but cannot afford both properties (I currently rent) as it would be £1600 per month for both - way beyond what we can afford. We have therefore asked her to pay towards the cost of the mortgage payments for as long as she is there. She got 50% equity from the ToE - £26k.She has refused to pay this, telling us to get a court order as that's the only way she'll pay.We have tried to be fair to her, but she now seems to be taking advantage. To my mind, even if the agreement was still in place, there was nothing in there about it being free-of-charge or sole occupancy; however, the agreement was removed in any case.Is she right in her assertion that we would have to get a court order?Are we being unreasonable? The only alternative we have if she doesn't pay is to move in with her, which would be less than satisfactory for all concerned.They are married (as opposed to common law) and have adult children over 21 so there are no child issues. Prior to the ToE, she hadn't worked for over 15 years, hence her being unable to buy him out of the property.Any advice would be gratefully received. The only way to get her out is to go through legal channels. If your boyfriend's ex is refusing to move from the property, then you would have to get a court order in order to have her evicted, and/or a court order that says she has to pay rent in the interim period. My boyfriend and I have recently bought his estranged wife out of their property (transfer of equity - ToE). As part of the transfer, we originally agreed - at her request - that she stay in the property following completion for 56 days. However, the mortgage provider refused this condition and it was removed from the Independent Legal Advice letter prior to completion and stated that she would vacate the property on completion. She is still trying to stay for the 56 days. We have said that we are not averse to this, but cannot afford both properties (I currently rent) as it would be £1600 per month for both - way beyond what we can afford. We have therefore asked her to pay towards the cost of the mortgage payments for as long as she is there. She got 50% equity from the ToE - £26k. She has refused to pay this, telling us to get a court order as that's the only way she'll pay. We have tried to be fair to her, but she now seems to be taking advantage. To my mind, even if the agreement was still in place, there was nothing in there about it being free-of-charge or sole occupancy; however, the agreement was removed in any case. Is she right in her assertion that we would have to get a court order? Are we being unreasonable? The only alternative we have if she doesn't pay is to move in with her, which would be less than satisfactory for all concerned. They are married (as opposed to common law) and have adult children over 21 so there are no child issues. Prior to the ToE, she hadn't worked for over 15 years, hence her being unable to buy him out of the property. Any advice would be gratefully received. If you comply to the terms of the court order, you are not in breach of the order and your ex has no recourse to refer the matter back to the courts. Only if you breach the terms of the order does your ex have grounds to refer the matter back to court. I was divorced 3 years ago we have a financial order re house and maintenance my ex pays all monies are in place no problem. But I was suppose to move year ago but we made an agreement that as long as he’s paying the correct amount towards the Kids and housing which he does I can stay in House for kids sake. Have I breached order? Even though we have agreed on all of the above? Any changes to a contact order must be agreed by both parties. One party cannot unilaterally decide to change the order or apply additional terms. Therefore, if you have both agreed, while the order may be theoretically breached it is done so in agreement. If you want to secure this new agreement, you may wish to consider mediation.